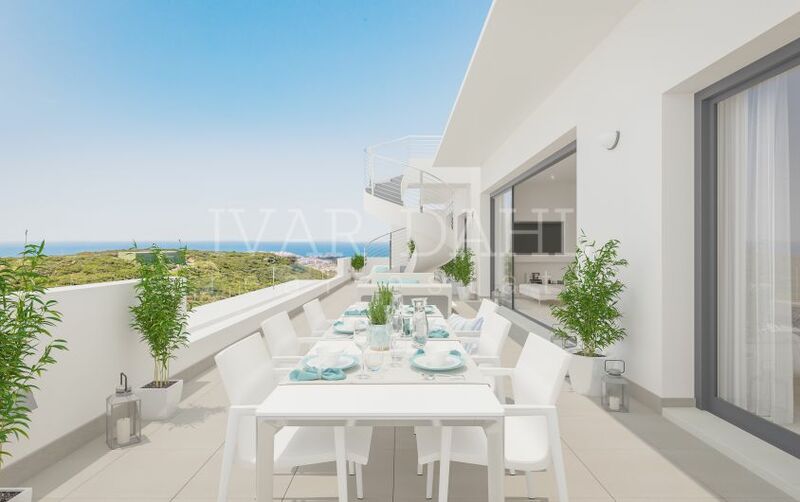 Town House for sale in Casares with 2 bedrooms, 2 bathrooms and with orientation south, with communal swimming pool, private garage and communal garden. Regarding property dimensions, it has 241.84 m² built, 67.77 m² plot, 184.56 m² interior and 57.28 m² terrace. Has the following facilities air conditioning, brand new, fully fitted kitchen, fitted wardrobes, spa, private terrace, dining room, laundry room, living room, utility room, gated community, double glazing, mountain view, golf view, country view, sea view, close to golf, inside golf resort, front line golf and mountainside. 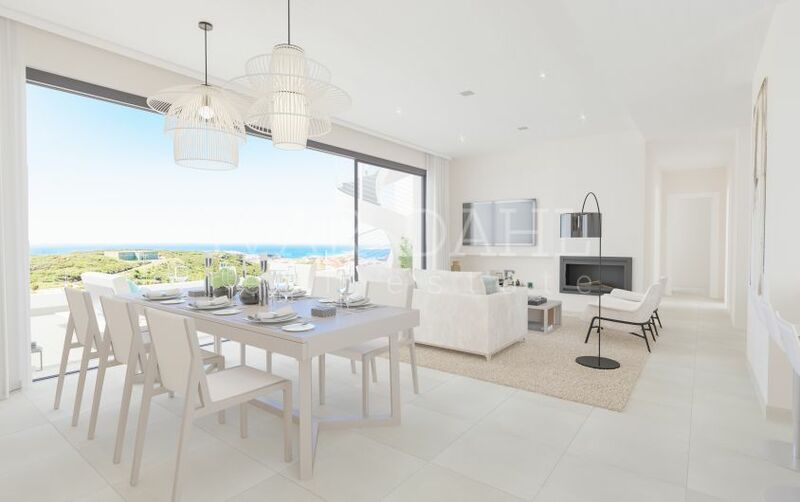 This is a new Real Estate Promotion of apartments, penthouses and townhouses, located on a hill within what is considered the best Golf Resort in Europe in 2017. The environment is characterized by the great diversity and quality of its offer, perfect to enjoy a full life, the southern and Mediterranean lifestyle, full of emotions, sensations and unforgettable experiences, stroll and enjoy the world-famous Marina of Puerto Banus at only about 30 minutes, or the select Marina of Sotogrande 10 minutes from Casares, only about 10 minutes famous for its international sailing or Polo competitions. Ten minutes away from the “Costa del Sol Garden” as it is now known to a spectacular and renovated Estepona and 10 minutes from Casares, a typical Andalusian village of the interior all south of the Mediterranean, without a doubt, a place to enjoy life. One of the main characteristics of this residential complex is the LOW CONSTRUCTIVE DENSITY, very few units in a large space. 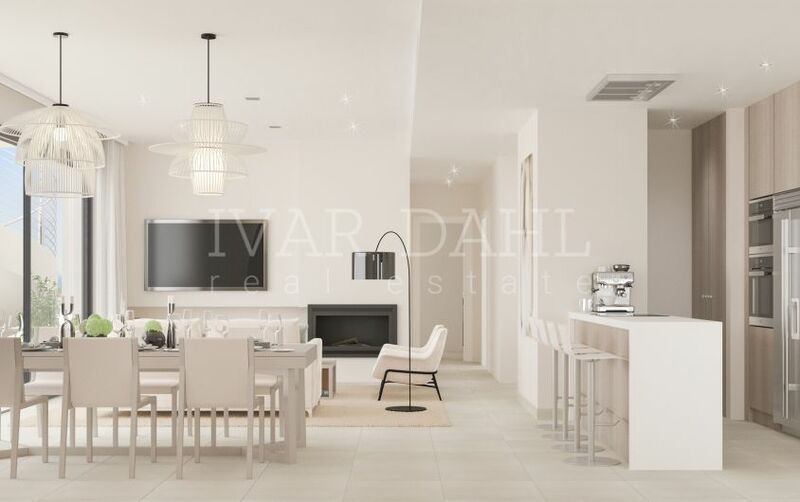 THE EXCLUSIVITY that also allows the development of houses with large rooms and large terraces with a VANGUARD ARCHITECTURE visually very attractive, elegant, relaxing and cared for finishes, generous and beautiful spaces designed to be enjoyed at all times. The result is a set of high-level housing, divided into 3 blocks of only 44 dwellings in total. The common areas can be developed fulfilling the best expectations of the users. 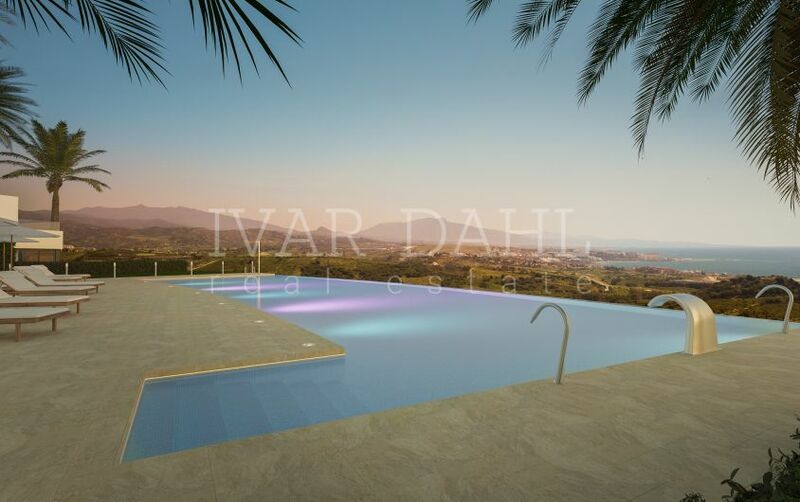 • The residential has an infinity pool with garden area in its surroundings. 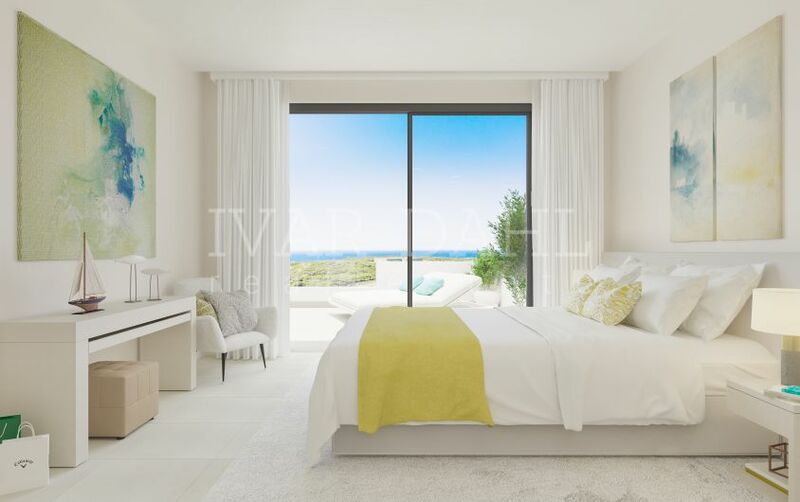 Spectacular views to the sea and golf. • Zona Spa in the pool , with a Swan Collar and two Water Cannons. • Saline chlorination infinity pool. • Spectacular scheduled scenes in the pool at dusk and night with LED RGB lighting that will allow you to enjoy stage alongside the absolutely unique views. • Tropical gardens with automatic irrigation. • Automatic access door with controls for opening. • Garage with installation of recharging point for electric vehicles in the garage area. With possibility of loading semi-fast or slow. • Large individual storage rooms. In Andalusia, on the Costa del Sol, life is lived outside. In order to take advantage of the excellent climatic conditions, the terraces are an important part of the houses, large outdoor spaces with CRYSTAL RAILINGS so as not to detract from the immense feeling of the views. 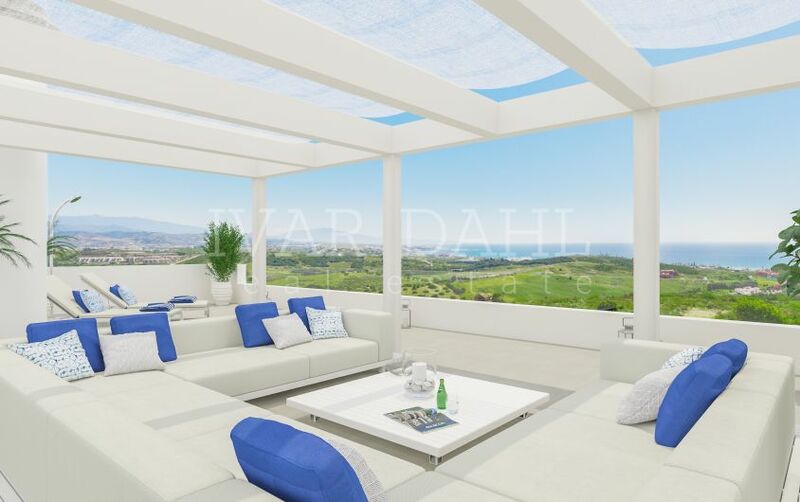 The outdoor spaces, with the large areas of the terraces, the solariums and the gardens,will be the ideal place for the enjoyment and the celebration of the day to day life. The buildings are really attractive on the outside. The architectural lines that make it so spectacular are prolonged in the houses, creating SPACIOUS AREAS, that take advantage of the excellent location to continue enjoying the views from the inside integrating the exterior as if a natural prolongation. Also the interiors are really bright and spacious. 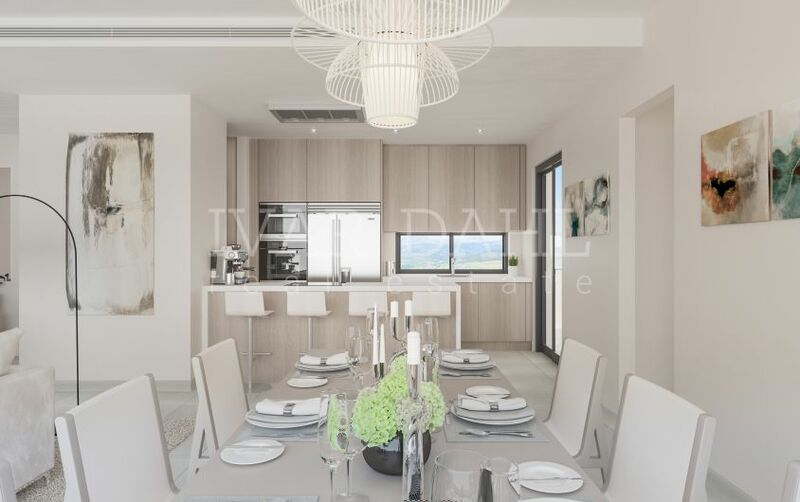 Large dining rooms with integrated kitchens, fully EQUIPPED WITH SIEMENS appliances (or similar), with furniture and hood flush to ceiling and American fridge in the penthouses, two terraces and, overlooking the Sierra de Casares and Estepona. 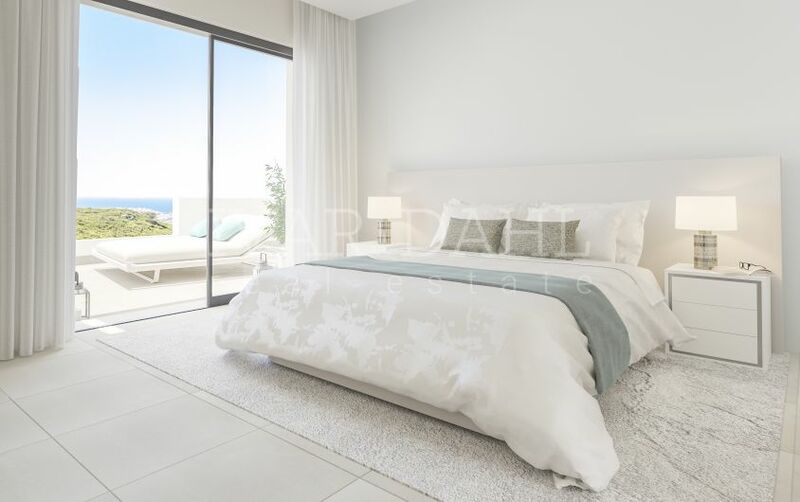 The main bedrooms with bathrooms en suite, dressing rooms, wardrobes with lighting with LED strips and terrace. 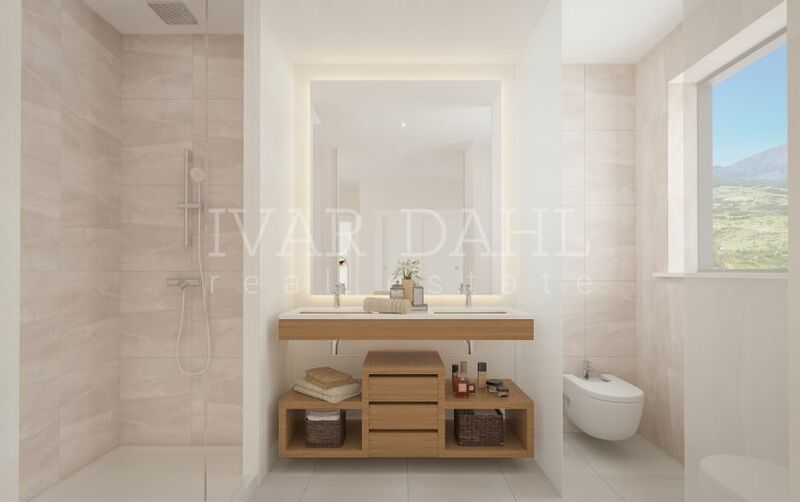 Bathrooms with rain shower, suspended toilet, hidden cistern and whirlpool in the penthouses and townhouses. Enjoy the unbeatable sea views from your jacuzzi in the solarium or your private pool (optional both in penthouses, in townhouses and ground floor apartment) or in the spectacular common swimming pool type “Infinity” with a water slide of 197 m² and relax in its SPA area (Swan Collar and 2 Water Cannons) contemplating the different scenarios created by the amazing RGB LED LIGHTING at dusk, a whole show. 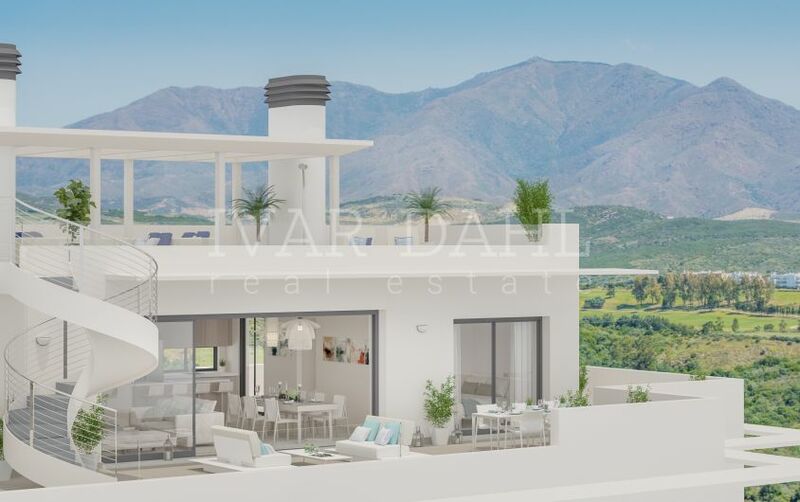 Please, send me more information about ref 5074, Town House in Finca Cortesin, Casares or similar properties.